Food allergies have become a global challenge to food safety in industrialized countries in recent years. With governmental monitoring and legislation moving towards the establishment of threshold allergen doses, there is a need for sensitive and quantitative analytical methods for the determination of allergenic food contaminants. 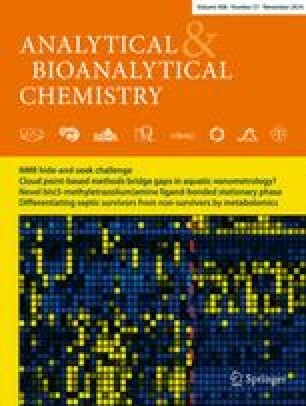 Targeted proteomics employing liquid chromatography–mass spectrometry (LC-MS) has emerged as a promising technique that offers increased specificity and reproducibility compared to antibody and DNA-based technologies. As the detection of trace levels of allergenic food contaminants also demands excellent sensitivity, we aimed to significantly increase the analytical performance of LC-MS by utilizing multiple reaction monitoring cubed (MRM3) technology. Following a bottom-up proteomics approach, including a straightforward sample preparation process, 38 MRM3 experiments specific to 18 proteotypic peptides were developed and optimized. This permitted the highly specific identification of peanut, almond, cashew, hazelnut, pistachio, and walnut. The analytical performance of the method was assessed for three relevant food matrices with different chemical compositions. Limits of detection were around 1 μg/g or below in fortified matrix samples, not accounting for the effects of food processing. Compared to an MRM-based approach, the MRM3-based method showed an increase in sensitivity of up to 30-fold. Regression analysis demonstrated high linearity of the MRM3 signal in spiked matrix samples together with robust intersample reproducibility, confirming that the method is highly applicable for quantitative purposes. To the best of our knowledge, we describe here the most sensitive LC-MS multi-method for food allergen detection thus far. In addition, this is the first study that systematically compares MRM3 with MRM for the analysis of complex foods. The online version of this article (doi: 10.1007/s00216-016-9888-y) contains supplementary material, which is available to authorized users. We thank Imke Westkamp for excellent technical assistance and the Bavarian Agency for Health and Food Safety (LGL) Oberschleißheim for the real-time PCR analyses. We also acknowledge support from the German National Academic Foundation (Studienstiftung des Deutschen Volkes) for funding this work by providing a Ph.D. scholarship. The authors declare no conflict of financial or nonfinancial interest in the work that is presented in this study. Holzhauser T, Röder M. Polymerase chain reaction (PCR) methods for detecting allergens in foods. In: Flanagan S (ed.) Handbook of food allergen detection and control. Cambridge: Elsevier; 2015. doi: 10.1533/9781782420217.2.245. Hövelmann Y, Hickert S, Cramer B, Humpf H-U. Determination of the exposure to the Alternaria mycotoxin tenuazonic acid and its isomer allo-tenuazonic acid in a German population by stable isotope dilution HPLC-MS. J Agric Food Chem. 2016. doi: 10.1021/acs.jafc.6b02735. Korte R, Monneuse J-M, Gemrot E, Metton I, Humpf H-U, Brockmeyer J. A new HPLC-MS method for the detection of lobster and shrimp allergens in food samples via MRM and MRM3. J Agric Food Chem. 2016;64:6219–27. doi: 10.1021/acs.jafc.6b02620.